Welcome. Also, why not post a pic of the tyre pressure sticker that is by the door jam. Once other posters have seen what the manufacturer recommended pressures are, they can better advise a good operating pressure for you. Those tyre pressures aint far off - esp when carrying a load. Don't, like many, expect a pick up truck to handle like its on rails - it won't. A pick up is designed to carry goods and as such has fairly rigid/basic suspension esp the rear and in standard form, run on very high profile tyres. Pick ups are also relatively high compared to a car. Remember your driving what is in essence, a goods vehicle and you'll be fine. My father did not give me much advice. But one thing he told me was buy the best tires possible for your vehicle. They are the foundation of your vehicle and in reality could prevent an accident or even safe your life. Door jam? Did you close it on your foot accidentally? Is this really a thread about someone putting too much air in your tyres? Yes it is. A slow day on TV. Where I have lunch sometimes is opposite a B Quik and it’s a constant stream of cars waiting to top up their tyre pressure, some pick ups but mainly cars, it’s like a drive thru , most don’t get out of their vehicles !! They definitely don’t adjust the pressure for different vehicles, it’s whatever the compressor delivers . Folk who go in for a top up are probably not getting the correct pressure anyhooo because the tyre and inside air is hot and PSI will have increased and the advised PSI is for cold tyres..
My Vigo PSI was 29/30, if I called in on route 35 would be OK but check them myself the next morning cold, if I had a new tyre or puncture repair I would insist on 29/30.. 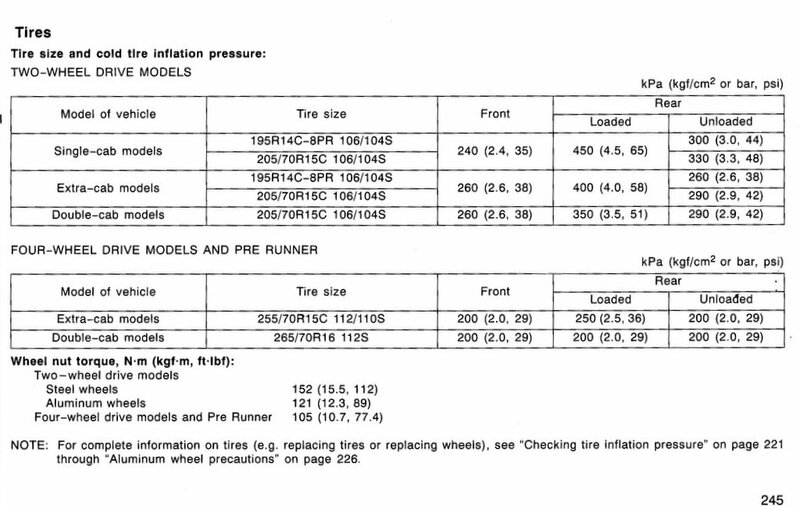 Here is the Vigo advised cold tyre PSI page from their handbook, yes it can be confusing but just shows the huge difference between different models and tyre sizes regarding PSI.. Apologies if this slightly strays from the topic but given that knowledgeable guys are on this thread I wanted to ask about ‘chipping ' my Isuzu pickup as it’s 4 years old and out of warranty. 2015 3 litre manual 4 door. I understand the process can deliver better economy and power . If anyone can guide me ,or indeed has kit that they now want to sell , I’m all ears. I did learn from this thread about the different suspension between 2 and 4 door ,subsequently checking my 4 door to notice there are just 2 leafs in the spring and Bridgestone tyres - so thanks for that! From my perspective I can say the ride is reasonable other than on patchy surfaces but guess a live axle and leaf springs will always be inferior to a car's setup. As the part of the vehicle usually with the most contact on the road surface why would you want to scrimp? I'm just curious to know what part of your vehicle makes contact with the road the rest of the time? I see. 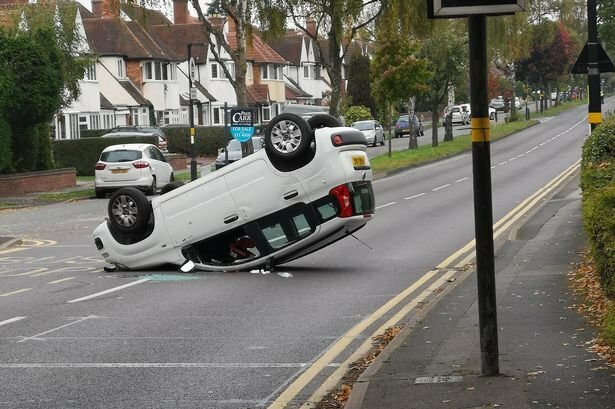 You usually drive along on your tyres, but sometimes you take it for a scrape on the roof. Car manufacturers are in constant competition to make cars that deliver better economy and power to increase sales. If by simply “chipping” the ecu this can be achieved, I wonder why their engineers whom are no less brainier, don’t do this already in the first instant. There must obviously be some long term adverse effects.